Coach Rob Paternostro says Leicester Riders' fine display in the BBL Cup final did little to ease the pain of losing to Newcastle in the showpiece event in Birmingham. 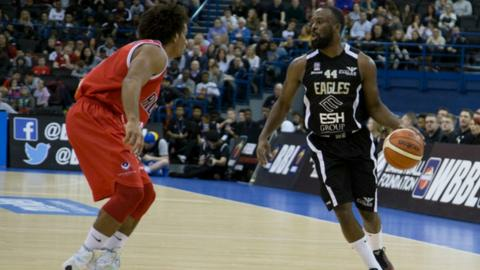 Riders led by 14 points in the third quarter, but a stunning Eagles comeback saw them triumph 92-84. Paternostro told BBC Radio Leicester: "You feel a responsibility to put on a decent show at a big event. "No doubt we did that, but that doesn't take away the hurt." The final at Birmingham's Barclay Card Arena was the third time in four seasons that the two teams have met, with Leicester winning in 2013 and 2014. Paternostro said the quality and experience in the Eagles side told in the closing stages this time around. "That group have played so many games together and have been in every situation possible," he added. "We have a group that have played a lot together but nowhere close to that. "The bottom line is that their players are good and can make some really tough plays when it counts. They are loaded talent-wise. "But we have a lot of tough guys, both mentally and physically and we will bounce back. We have a lot to look forward to. We will be able to turn it around and come back strong."